I have to start with the anthemic rock guitar shred. It’s Chuck Loeb on track seven and it’s a complete surprise showing up in the middle of a Fourplay album. But, while Fourplay’s trademark has been consistency there have always been surprises. These four musicians can play anything and over their careers they all have. Loeb has had smooth jazz chart toppers, straightahead adventures and he was one of the founders of the slammin’ adventurous fusion band Metro. Listen to how “Silver Streak”s solo lead breaks into a segment of shimmering textural instrumentation provided by Bob James’ piano and Fender Rhodes. Then it kicks in again. This band may be celebrating silver but they aren’t getting old. 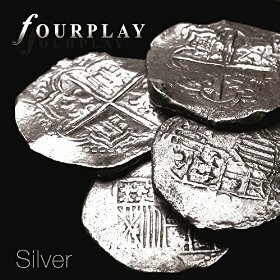 Silver is Fourplay’s 25th anniversary celebration and what a celebration it is. The original lineup first assembled during the sessions for James’ Grand Piano Canyon album and the chemistry was too good to abandon so they went into the studio and recorded the debut. It was released in 1991, went gold and stayed at the top of the charts for 33 weeks. More gold and Grammy nominations followed as the band that started and this superband experiment in musical interaction and chemistry is delivering 14th album. They returned to the studio where they recorded their debut with the intention of keeping the spirit of that first album and continuing the evolution of the music they have created since then, which is an impressive and extensive body of work to say the least. They have done that and more. This is my favorite Fourplay album since their debut, which will always be iconic to anyone who was impacted by their first listen when it was released. Here are 10 tracks that are the essence of what this band does best without side trips into vocals and covers. Obviously musicians of this caliber with multigenre backgrounds are going to stretch into other aspects of what they do and back some amazing singers, and deliver their spin on some songs their audience already loves, but wow, there’s nothing like an hour of original music from players of this calber. Each member contributed songs they either wrote by themselves or with other members of the band and former guitarists Larry Carlton and Lee Ritenour return for one song each while Kirk Whalum adds some sax to a track. The opener, “Quicksilver” feels surprisingly similar to the debut album’s opener, “Bali Run,” with its subtle intro, rhythmic backbeat and a tight guitar lead that in this case trades off with James’ piano. James is upfront on “Horace,” a jazzy, gently swinging tribute to pianist Horace Silver. Gorgeous textures and the trademark vocalese that has become so much of their identifiable sound permeate the album. Listen to “Sterling,” the interplay between the musicians is so fluid and intuitive and the song has this subtle energy that is also present on a bluesy “Silverado,” co-written by and featuring Larry Carlton’s immediately recognizable guitar work, and the joyous, spirited Anniversario. Ritenour appears on “Windmill,” an updated take on a song he wrote with Mason and originally recorded on the Portrait album. The album seems to alternate between softer more improvisational tracks and the fuller, more energized tracks. This creates a lovely flow and these mellow tracks aren’t your standard easy background music, they are substantive and calming at the same time. Who else could pull that off. Next time you want to scream at the driver in front of you or literally stick a fork in a co-worker put on some headphones and cue up “Mine” or “Precious Metal” with Kirk Whalum’s soulful sax. I have often wondered how and why the well of creativity seems to flow continually and deeper as some musicians careers span decades while others get locked into an era or a style and repeat what they have done in the past. This is a trap James, Mason, East, and Loeb have avoided both in their solo work and these collaborations. How do you remain consistent without being boring, identifiable without being repetitive, and keep pushing each other to expand on what they did before. It’s definitely a case of the sum being more than the parts, and when the parts are these four musicians the combination is transcendent.